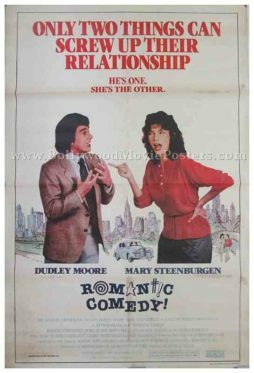 Old Hollywood movie poster of the classic Dudley Moore film, Romantic Comedy (1983) for sale. Featured here for sale is an actual surviving vintage Hollywood movie poster of the American film, Romantic Comedy. Printed in India during the local release of the film somewhere in the 1980s, this old Hollywood movie poster was originally intended for publicity but never ended up being used. Romantic Comedy is a 1983 American film starring Dudley Moore and Mary Steenburgen, directed by Arthur Hiller.